My eyes flew open to the blue wallpaper. I could hear the heat kick on, two floors down. The loud clanging sounds meant one thing, getting louder and faster, sounding as if a lumberjack was locked inside the furnace and swinging his axe. For three days, our house had no heat. My sisters and I wore hats and complained about the oil man as we played Sandwich between the couch cushions and kept looking out the window for his blue van. When he didn’t show, we trudged outside and our nostril hairs froze. We entertained ourselves by sleigh-riding down the side yard hill. At the top of the hill, we positioned the long red sled between the rocks and the Mountain Laurel tree that we were not to touch because it was planted by the hunchback. We always sat in the same order: Laurette went first, and Rene was in the middle. Rene, being the baby, was not allowed to push the sled off the rocks using her hands. We didn’t want her fingers to be crushed. So Laurette pushed from the front and I pushed from behind and jumped on. We started to pick up speed and leaned together to steer the sled into the giant maple tree root, which stopped us from flying onto the road. We went up and down a few times. On our last run we rolled off the sled and sucked the icicles on our scarf fringe. Since it was cold inside, we stayed longer on our stomachs in the snow and talked about when the hugging pipe would be back. There were rules about the hugging pipe. Whoever got to it first did not have to share. 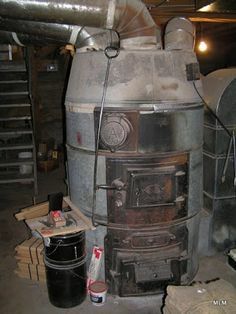 We would wrap legs and arms around the heat pipe and wait for the warmth that rose from the furnace in the basement. We hugged the hugging pipe when we were tired, or cold, or upset, or bored. Or waiting for dinner. Sometimes I would let my little sister Rene hug the bottom if I had the top, which was nice of me. But now it was morning and I sat in bed listening to the clanging. The oil man had performed a miracle. I ran down the steps to the thermostat in the dining room and pushed the dial to 80 so we would warm up quickly. Then I stood at the hugging pipe near the dark kitchen and waited. My sisters walked downstairs in their nightgowns and there was no fighting over hugging pipe rights. We improvised and pressed our cheeks against its cold. “Can you feel it?” said Laurette, worried. “I can hear it,” said Rene. “It’s by our toes!” I said. Great blog Amy! I could see the scene in my head so clearly. You write so vividly, it is a treat to read. Thanks for stopping by, Robert! !